:The heart of Christianity is trinitarian. The subject matter of Trinitarian Theology casts a long shadow over our faith. The relationship between the Father, the Son, and the Spirit is central to the salvation story. The Trinity is central to Christianity, for the vibrancy of our churches, and for the clarity of our witness in the world. In Trinitarian Theology, Bruce Ware, Malcon B. Yarnell III, Matthew Y. Emerson, and Luke Stamps discuss issues such as the eternal functional subordination of the Son, the nature of the God-human relationship, and theological methods for forming the doctrine of the Trinity. This is a discussion of great importance, offered by scholars who represent varying views held by today's Southern Baptist scholars. 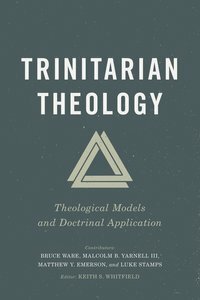 About "Trinitarian Theology: Theological Models and Doctrinal Application"